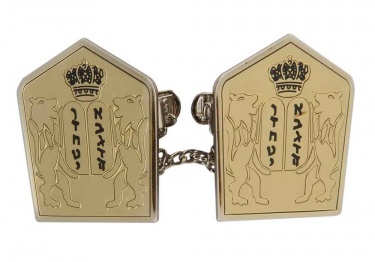 Gold toned Tallis Ten Commandments clips with Hebrew lettering contrasting in black. The commandments are surrounded by the Lions of Judah and topped with a crown. Measures 1 1/4"W X 1 1/2"L. Makes a great Bar Mitzvah and Bat Mitzvah gift.